Creations drop in art studio caters to visitors looking for what to do and see in Sandpoint, Idaho. Visit the iconic Cedar Street Bridge in downtown Sandpoint and enjoy the wonderful view of North Idaho mountains and water while you and your kids make art! 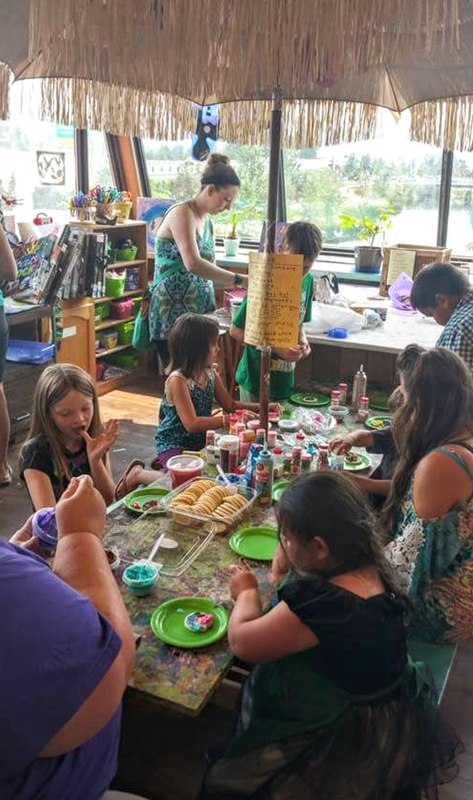 Creations' founding element is the drop in art and craft studio where children and adults can come draw, paint and create using donated art supplies. The art studio is stocked with crayons, markers, paint, pencils, colored paper, wood blocks, patterned fabric and many more supplies donated by the community. Follow your own creativity or try one of Creations's rotating craft ideas. Creations is excited to announce our completed art studio renovation thanks to participant donations and grants from the Innovia Foundation, Angels Over Sandpoint, Community Assistance League and the Idaho Community Foundation. Check out art students enjoying the new art studio in pictures below, or even better come in an see our new art studio in person! Come in and create today!